Recently, Burger King has been under fire due to a leaked commercial starring hip-hop singer Mary J. Blige promoting their new crispy chicken wraps. 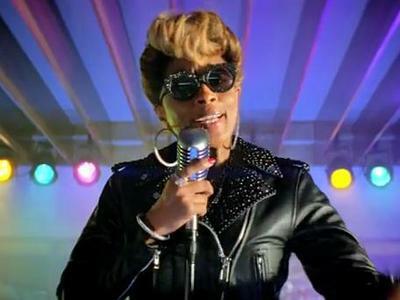 In the commercial, a customer asks a Burger King cashier what’s in the new crispy chicken wrap, and before she can answer, Blige appears in the dining room and rhapsodizes about “crispy chicken, fresh lettuce, three cheeses, ranch dressing wrapped up in a tasty flour tortilla.” During the performance, Blige’s vocals are backed by a hip-hop beat and the Burger King slowly transforms from a fast food eatery to a hazy night club, replete with flashing multi-colored lights and patrons getting their groove on. The ad was quickly picked up as a topic of conversation by our ravenous cyberculture. Unsurprisingly, most of the attention was focused on the ways in which the ad invokes and promotes black stereotypes in the service of appealing to a black demographic. As a blogger on Madam Noire put it, “Having a black woman sing about chicken was no mistake. They’re trying to reach the “urban” (aka black) demographic. And God knows black folk, won’t buy anything unless there’s a song, and preferably a dance, attached to it.” Even Forbes magazine contributed a piece showing how the ad has significantly decreased the standing of Burger King in the African-American population. In the ads run by Dr. Pepper in 2011, their new diet drink Dr. Pepper 10 was sold with the tagline “it’s not for women,” and used a variety of masculine stereotypes – Yay action, guns explosions! Boo romantic comedies and “lady drinks”! – to pitch their product to a specific demographic: men. In essence – and leaving aside the deeply problematic ways in which the commercial denigrates femininity – this advertisement was just as essentialist and offensive as the Burger King ad, only it drew on stereotypes of masculinity instead of black people. And while this advertising campaign indeed did hurt Dr. Pepper’s standing in the eyes of consumers, the commercials continue to run and you can still like Dr. Pepper 10 on Facebook for access to Dr. Pepper 10’s “Ten Manaments.” So what’s going on here? If both of these advertising campaigns are using stereotypes to sell products, why has the backlash against the Burger King ads caused such an uproar while the Dr. Pepper 10 campaign continues? The largest difference in these two advertising campaigns is power. I hope I’m not rocking anyone’s world when I say that men hold more power in our society than black people. By this I mean to say that in our patriarchal society men, through their demographic weight at advertising firms, movie studios, and television channels, especially in terms of upper management and direction, are well situated structurally to define what a “real” man is. 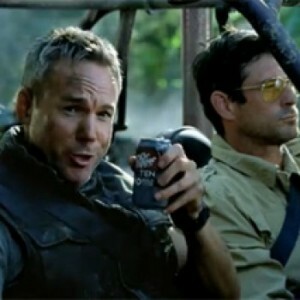 If the exaggerated masculine identity in the Dr. Pepper 10 ad is a joke, the position of men in creating the ad means the joke is self-deprecating. By contrast, black people have by and large very little say in the sort of images and identities that circulate depicting blackness and black culture. If the stereotypical blackness in the Burger King ad is a joke, the joke is on them. To put this sociologically, we might say that that the powerful position occupied by men in society allows them to choose, or assume the hypermasculine identity displayed in the Dr. Pepper 10 ad, but it also allows them to reject it. For black people however, the lack of power means that the vision of blackness put forth by Burger King does not come from black people themselves but is imposed, or assigned by the dominant (white) culture. Because the identity is assigned externally and because the identity lines up with dominant cultural stereotypes, there is no option to accept or reject the association made between themselves and the chicken loving, clubbing version of themselves offered by Burger King. Another way this power imbalance shows up is in heterogeneity of representation in media. Dr. Pepper 10 may play into a stereotypical version of masculinity, but there are a myriad of cultural productions that display different performances and embodiments of masculinity than shown in the ad. We have Arnold Schwarzenegger or Jason Stratham, but we also have Jim Carrey or Adrian Brody. We have Team Edward, but we also have Team Jacob. But when it comes to portraying black people, the types of representations offered in popular media are much more stereotypical. While there has been arguable progress on this point, representations showing black people as angry, violent, criminal, or hypersexual still dominate American movies, television, and advertisements. In short, the Dr. Pepper 10 ad does not lead the average viewer to the conclusion that all men must be like that, because the idea that there are more diverse ways to “be a man” than those offered in the commercial is patently obvious to them. In contrast, because the media shows us less ways to “be a black person,” the vision of blackness promoted by the commercial snugly fits into the limited identities popular culture puts forth, thereby helping to reify stereotypes about black people. Furthermore, and unlike men, there are many places in the United States where the largest exposure people have to black people is through media representation, giving these representations added weight in shaping who black people are or should be in the eyes of the viewer. Another factor that must be taken into consideration when sociologically thinking about the reasons for these disparate responses is history. The association between black people and fried chicken has a long history, dating from the days of slavery where blacks ate fried chicken in the form of table scraps from slave owners. Then in the early days of film, blacks were uniformly portrayed as chicken eating, dancing and jiving buffoons, willing to lie and commit crimes to get their chicken fix. More recently, we might recall Fuzzy Zoeller’s line to Tiger Woods after winning his first Masters championship asking him not to order fried chicken and collard greens for the Champion Dinner. The idea that all black people like fried chicken is obviously problematic, as its posits what one likes to eat as somehow derived from biology instead of being a personal predilection. As Dave Chappelle facetiously put it, “All these years I thought I liked chicken because it was delicious. It turns out I’m genetically predisposed to liking chicken.” For black people, having Burger King assume they like fried chicken signals more than just culinary disposition. It also aligns with a long cultural history which uses such apparently benign stereotypes to buttress more nefarious ones. If the average white viewer believes that his “black people like fried chicken” view has been validated through the Burger King commercial, the leap to take more negative stereotypes about black people as fact – criminality or hypersexuality, for example – is a much smaller one. This process has been touched on by some commentators during the course of discussing the ad when they describe the ways in which they avoid eating foods traditionally associated with the black community in public, afraid that the impression they want to give (“I like this food”) is not the impression people get (“See? Black people really do like that food!”). This again points to the workings of power in the difference between assumed and assigned identity. In conclusion, the disparate reactions to the Burger King and Dr. Pepper 10 commercials demonstrate that you can’t examine how stereotypes operate in society without paying attention to power and history. As shown in this popular parody of the Mary J. Blige ad, Burger King failed to realize that when you deal in racialized generalizations, you’re bringing a lot more to the table than just a tasty wrap. Amias Maldonado is a doctoral student at the University of Texas. His research interests include gender, sexuality, and critical race theory. He was born and raised in San Antonio and as such, he finds both fried chicken in a tortilla and Dr. Pepper without real sugary goodness completely ridiculous.